MOSCOW – Well before saying its official goodbye to departing head football coach Nick Holt, the University of Idaho started the search for his replacement. It’s one the Vandals hope will include former head coach Dennis Erickson. Erickson’s interest level is in question, and he might have NFL opportunities still available. Idaho athletic director Rob Spear said Monday in a news conference he began putting together contingency plans two weeks ago and has already started the interview process. Montana State head coach Mike Kramer interviewed Monday, and current Idaho assistant head coach Jeff Mills will interview later this week with Holt’s endorsement. Erickson is not yet scheduled to interview, and he did not return multiple calls from The Spokesman-Review. Names that could surface include Washington offensive coordinator Tim Lappano and Arizona assistant coach Kasey Dunn. Kramer, Lappano and Dunn are all former Idaho players. Shortly before Spear took the microphone, Holt spoke for a few minutes, then left the room without taking questions. “Two years ago when we first got here this job was not a very good job. Nobody wanted it,” Holt said. But Holt never offered a reason for leaving Idaho and taking an assistant coaching job with the St. Louis Rams under close friend Scott Linehan. Holt also received a substantial raise from his 2005-06 salary of $205,000. Both Spear and UI president Tim White underscored the importance of making a quick hire, with Spear indicating the Vandals would be ready to announce a new coach in 5 to 10 days. Erickson is the most prominent name on Idaho’s short list, with NFL head coaching stops in Seattle and San Francisco behind him. The 58-year-old turned around Idaho’s fortunes as head coach from 1982-85, and also coached Washington State for two years before leading Miami (Fla.) to national championships in 1989 and 1991. “If it proceeded in (Erickson’s) direction, we look back to the early 1980s as far as tradition and success of this modern era and that can be directly attributed to what Coach Erickson did and what we’re trying to re-establish here,” said Mills, who declined to comment when asked about his own candidacy. “From most people’s perspective, if it worked out that he came back as the head coach it would be outstanding for this program,” Mills added. The new head coach will have to work with Holt’s players and possibly some or most of his assistant coaches as well. Just last week, Idaho welcomed a new recruiting class and Holt said one of the main selling points to his new recruits was the continuity on the coaching staff. 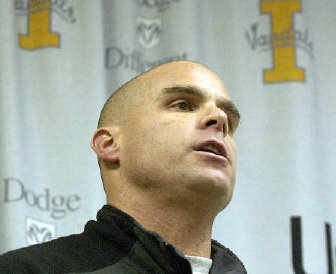 Monday, Spear was asked if the Vandals would release players from their letters of intent. One of those recruits, Mead senior Paul Senescall, said he had no desire to switch schools. The Vandals do have two other openings on their staff. Running backs coach Joel Thomas recently took a job with Purdue and wide receivers coach Chad Brown is now on the staff at Northern Colorado.